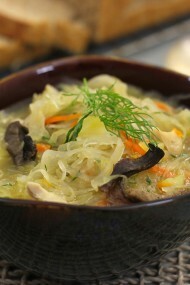 This soup has an incredible combination of flavors and textures. It comes together really quickly and if you prep all your ingredients ahead of time, you can be savoring every spoonful of it’s goodness within 30-40 minutes. It tastes refreshing, bright, filling and light at the same time. All the ingredients play an important role in balancing the flavors of sweet and sour with just the right amount of heat and saltiness. 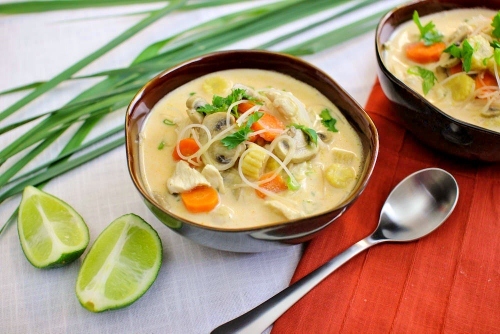 Thai Chicken Soup has been on my list of recipes to try for years now. I just never got around to actually making it. I read and compared many recipes and adapted the base of the soup from a recipe from America’s Test Kitchen and added what I thought would taste good for the rest of the ingredients. Boy, this soup knocked my socks off. It exceeded all my expectations and I will most definitely be making this many times in the future. Don’t let the long list of ingredients scare you. Most of them are flavorants and aromatics. Slice the chicken breast into thin slices, 1/8 inch thick. It’s much easier to slice if you place it in the freezer for about 15 minutes. Set it aside. Slice the mushrooms into thin slices also. 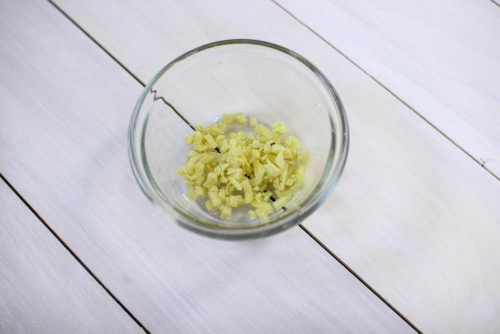 Bruise the lemon grass with your hands, peel the dry outer layers and slice the bottom portions into small pieces. Discard the top, woody part of the lemon grass. 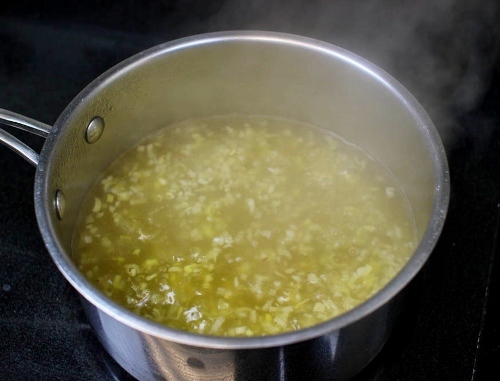 Lemon grass and ginger are absolutely vital for this soup. The flavor will not be the same if you don’t use them. There isn’t anything you can substitute for them either. They are sold in most grocery stores, but you may have to wait a little bit, since the stores don’t have them all the time. When you see it in stock, make some soup. 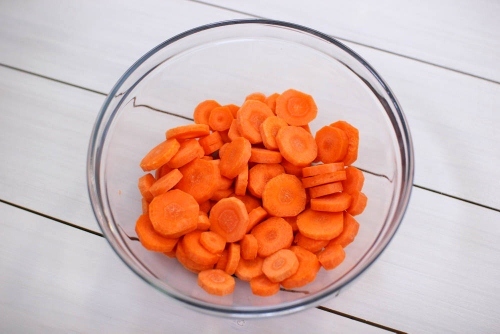 Peel and slice the carrots into thin slices. Cut the baby corn into small pieces or you can also keep them whole or sliced lengthwise. You can substitute regular, fresh corn instead of the baby corn. If you’re lucky enough, you may even find some fresh baby corn and use that. 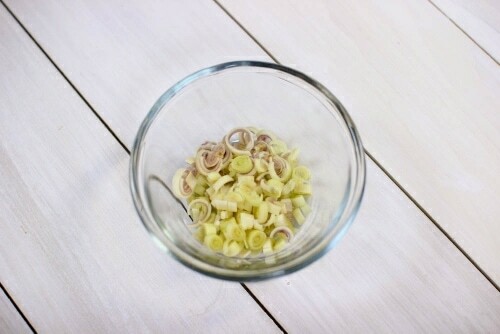 Cut the rice sticks/noodles into shorter pieces. Kitchen shears work great for this job. In a medium pot, heat the oil on medium heat. Add the ginger and shallots. Cook for 3-5 minutes, until the shallot is tender. Add the lemon grass. 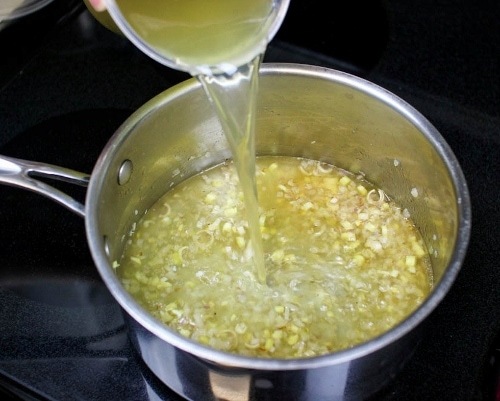 Pour in the chicken broth, bring to a boil, reduce the heat to low and simmer for about 15 minutes. Strain it through a fine mesh sieve. Discard the ginger, shallot and lemon grass. They have done their job. You’re basically infusing the chicken broth with the flavors of lemon grass and ginger. 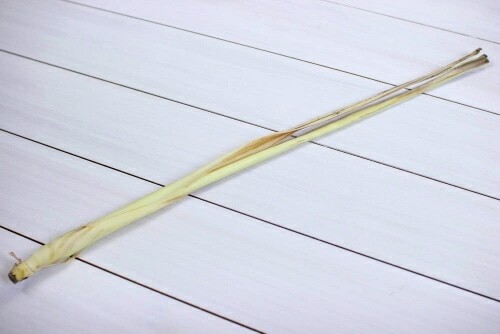 However, you don’t want to eat the lemongrass and ginger, since they are kind of woody and fibrous. In the same pot that you used, heat another Tablespoon of oil. Add the carrots and the jalapeno. Cook for about 5 minutes, until the carrots have softened. 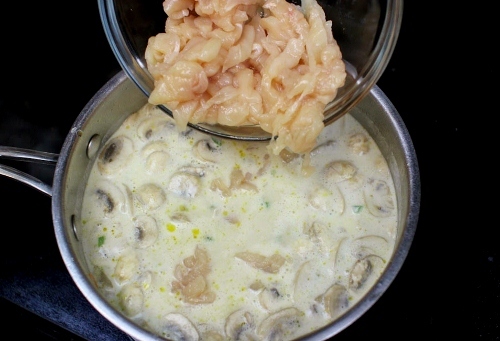 Pour in the strained chicken broth. Add one can of coconut milk. Add the fish sauce, mushrooms and baby corn. Cook for about 3 minutes. 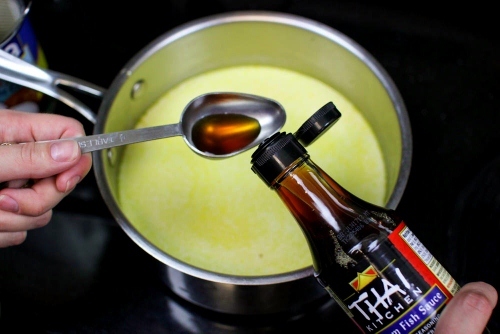 You can substitute soy sauce instead of the fish sauce. Add the chicken breast and rice noodles. 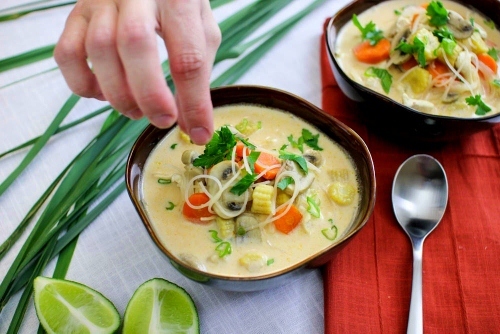 Pour in another can of coconut milk. 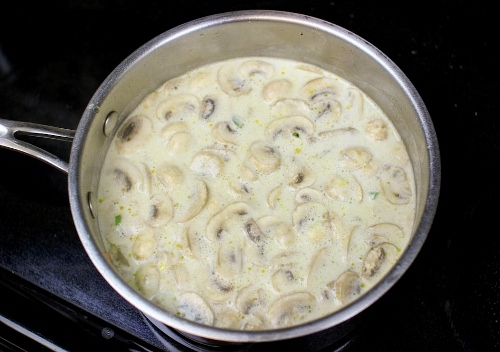 Adding the second can of coconut milk at the end of cooking will retain a fresh, coconuty flavor, and not taste washed out. Cook for another 3 minutes. Add the curry paste, lime juice and season with salt. 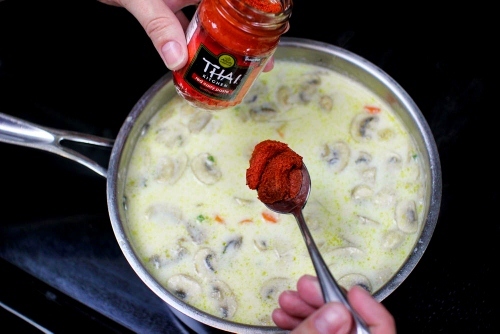 The Thai red curry paste is the secret ingredient of this soup. It is very easy to find and is sold in most grocery stores. 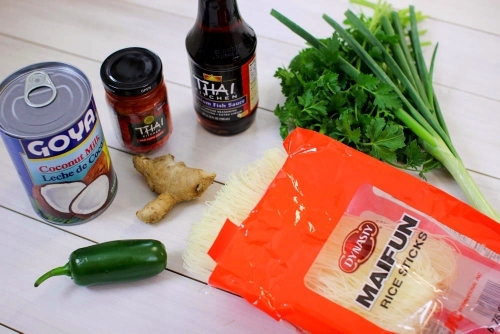 It has many complex Thai flavors of exotic ingredients that would be hard to find combined in one jar. You can add more or less according to your taste buds. Garnish the soup with fresh parsley and scallions. 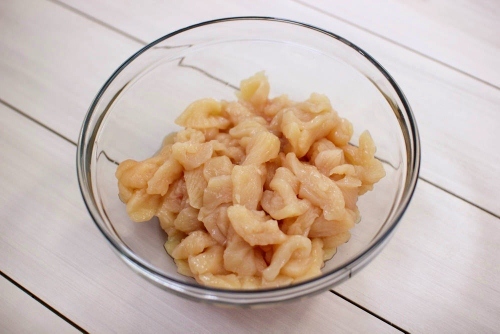 Slice the chicken breast into thin slices, ⅛ inch thick. It's much easier to slice if you place it in the freezer for about 15 minutes. Set it aside. 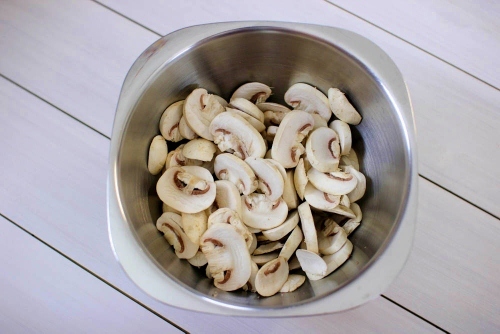 Slice the mushrooms into thin slices also. Bruise the lemon grass with your hands and slice the bottom portions into small pieces. Mince the ginger. 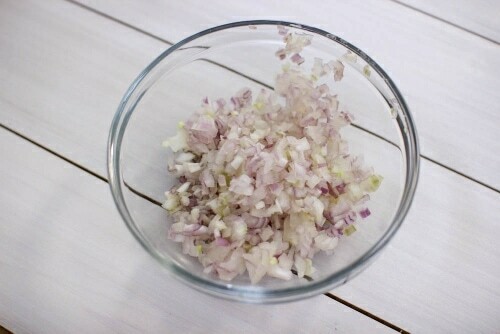 Chop the shallot also. 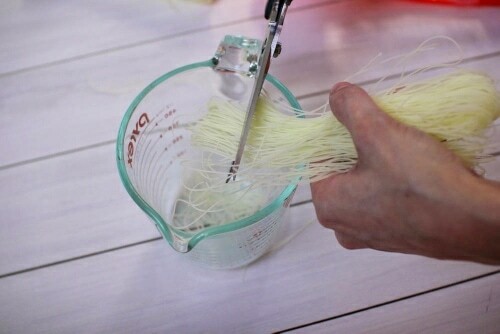 Cut the rice noodles/sticks into shorter pieces. 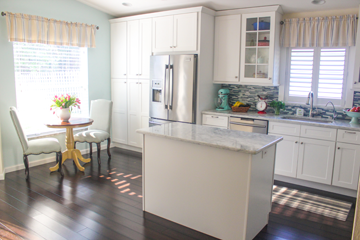 Kitchen shears work great for this job. In a medium pot, heat the oil on medium heat. 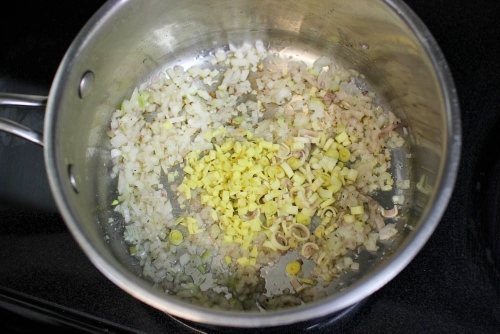 Add the ginger and shallots. 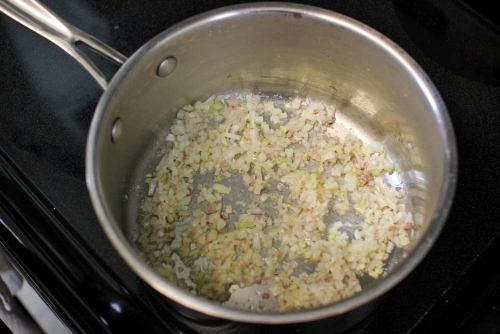 Cook for 3-5 minutes, until the shallot is tender. Add the lemon grass. 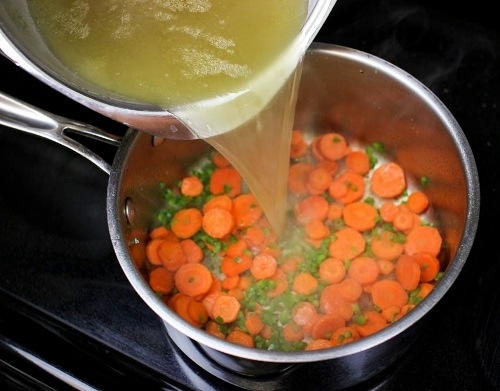 Pour in the chicken broth, bring to a boil, reduce the heat to low and simmer for about 15 minutes. Strain it through a fine mesh sieve. Discard the ginger, shallot and lemon grass. 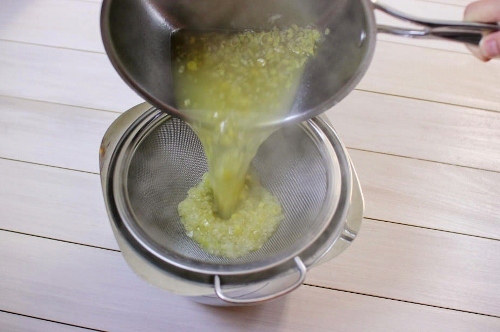 In the same pot that you used, heat another Tablespoon of oil. Add the carrots and the jalapeno. Cook for about 5 minutes, until the carrots have softened. 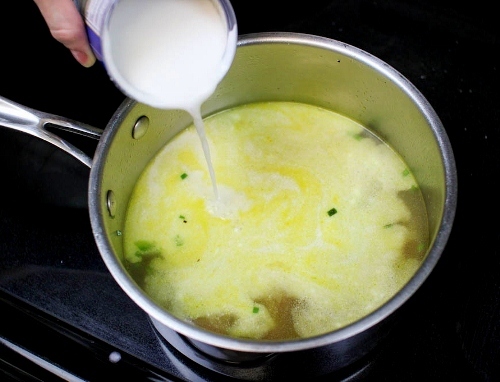 Pour in the strained chicken broth. Add one can of coconut milk. 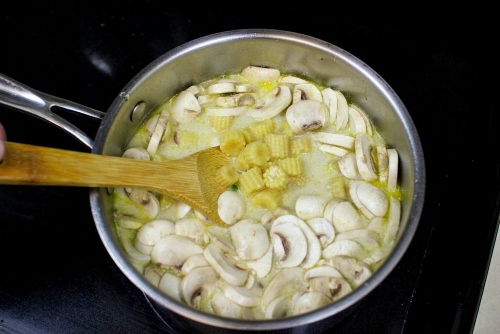 Add the fish sauce, mushrooms and baby corn. Cook for about 3 minutes. Add the chicken breast and rice noodles. 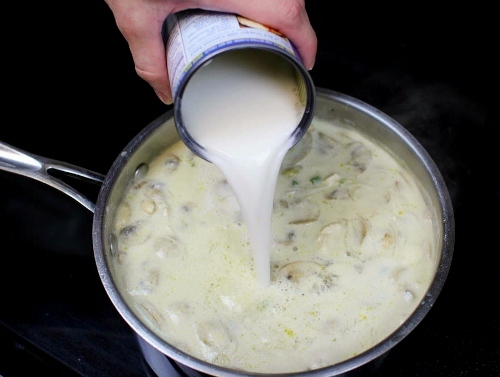 Pour in another can of coconut milk. Cook for another 3 minutes. Add the curry paste, lime juice and season with salt. 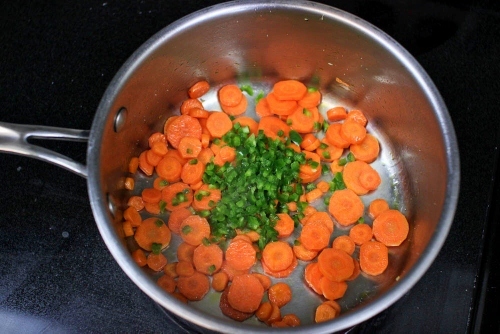 Garnish the soup with fresh parsley and scallions. Oh Olga, this looks so good. Can’t wait to make try it. 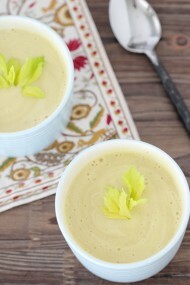 I love that you have so many soups on your blog. I love soups! That’s probably apparent. They are such a great meal, scrumptious and filling yet at the same time light. That’s my type of food. I have been waiting for this since you teased us with it on FB 🙂 Deffinitly going on my menu for next week. Can’t wait. 🙂 Thank you!!!! What an interesting soup recipe! I will have to give this one a try. I’ll have to go out and search for some of the ingredients, but i think it will be well worth it! I love the taste of coconut milk in different recipes 🙂 Thanks! You don’t have to use the jalapeno, but in my opinion it tastes better with it. I usually soak the noodles in advance also, but in this soup, the noodles cook so quickly, you don’t need to soak them beforehand. That’s wonderful to hear, Oksana. Love to hear feedback after others have tried a recipe. The ingredients are available in most grocery stores, which is why this recipe really appealed. I’m so glad to hear you enjoyed it too. Thank you so much! I am flattered:). Thanks for this recipe, I always order this at Thai restaurants. But wasn’t brave enough to try it on my own. But you defiantly make look simple, I gotta try it. But i wanted to ask : How spicy is this? 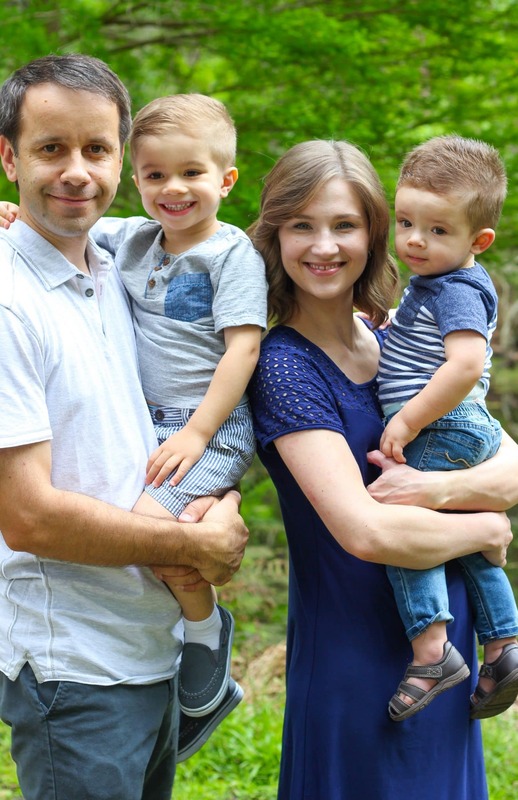 Would it be ok for kids? It’s not spicy at all. My husband and I both don’t like spicy things, so it’ll work for kids too. I’d love to hear what you think of it when you try it. That’s great! Good substitutions:). I’d love to hear what you think when you try it, Tallya. Made this a few hours ago! Your recipes have never disappointed me and Im adding this one to the list! Wonderful and flavorful. Thank you for all the Love you put into your food! I’m so happy that you liked this recipe. I’m always thrilled to hear great feedback. I was wondering if you know the nutrition facts for this recipe? Sorry, Julia, nope:) I am not a nutritional expert or a registered dietitian, so I wouldn’t be able to give you reliable information. I don’t normally comment on blog posts but this was amazing. I have been looking for a recipe like this for along time and this is the one. Thank you! Thanks so much for taking the time to comment, Lara! I’m always to happy to hear from people who have tried my recipes and enjoyed them too. Kids refused to eat it. So it’s a big minus for me, because I don’t want to cook multiple meals. Hubby and I ate it, it was good, but not great. I’m sorry to hear that, Inga. That’s the deal with food; everyone has different taste preferences. 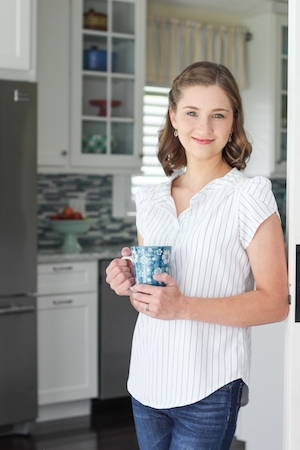 I share recipes that we enjoy with my family, but of course, every family is different. Oh, I understand.We enjoyed a lots of your other recipes! Finally, i found this amazing taste. Thanks for the recipe. Just made this soup, so yummy. That’s awesome, Tatu! Glad you enjoyed the flavors of this soup. This soup was so delicious and soo full of flavor! Yum! Yay! So glad you enjoyed it too, Amanda. Thanks for taking the time to write. That’s great, Galina! Glad to hear that you liked it. I make this soup so often and follow your recipe exactly. It’s my favorite soup of all time! Finding all the ingredients the first time can be tricky, but after the first time, you’ll have a lot of it in your house already like the fish sauce and curry paste. The jalapeno does not make it spicy if you’re worried about that. 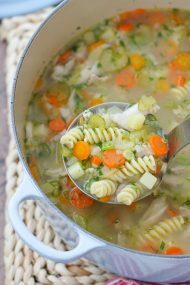 This soup is INCREDIBLE and packed with SO MUCH FLAVOR! 5 star recipe! Thank you, Amanda! I am so happy that you enjoy this soup. Thank you for taking the time to write. Thanks for the great recipe. I make the soup at least every 2 weeks, and my family loves it. Lately, I have substituted potatoes for rice noodles and chicken thighs for chicken breast, and we enjoy it even more. That’s great, Anastasia. I’m so happy you are enjoying the recipe. I LOVE this soup!!! I’ve made it twice and have made a few changes that, in my opinion, make it even better. 1. Add half each of one red and one green bell pepper cut into bitesize chunks and saute with the carrots. 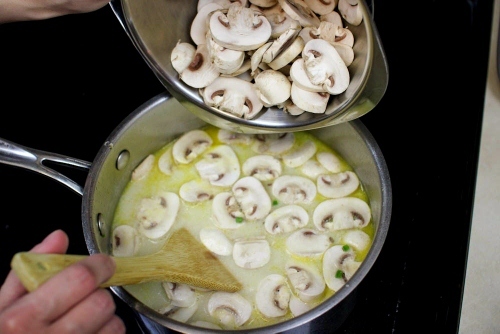 Then add the mushrooms and saute till soft. Portobella mushrooms have more flavor than plain white ones. 2. Brown the chicken pieces for a very short time before adding to the soup. It really improves the taste and texture a lot! 3. Use either purple/forbidden or brown rice instead of noodles. 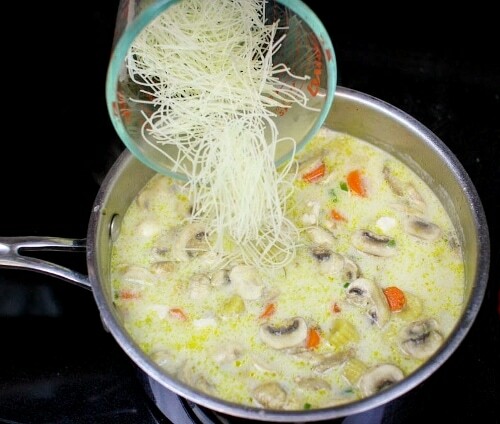 It has a wonderful chewy texture and nutty flavor which is more interesting than the noodles. 4. A Vietnamese friend advised me to buy frozen lemon grass and keep in the freezer so that I always have it. It’s amazing and so easy to use. 2 Tbsp frozen equals the usable portion of 1 stalk, so in this recipe I used 6 Tbsp and it was perfect. Now, I always have the ingredients on hand to make this soup! 5. I used more curry paste than suggested….about 7 or 8 tsp and it was great….has more of a kick. You can also add Sirachi sauce before eating for more zing. This change is appropriate for adults and probably not for children. I’m glad you enjoyed the soup, Sara. Thanks for sharing your input. Thanks, Olga! In my earlier comment, I meant to write, “Baby Bella mushrooms have more flavor than plain white ones.” Not portobello!